We Want to be Your Pallet Company! Fairfield Pallet Company, Inc. is a family owned and operated pallet supply, repair, and recycling company serving NY, NJ, DE, MD & VA since 1969. Get pallets delivered to your door with Fairfield Pallet Company, Inc. Call us at 856.455.7999 Today! With nearly 50 years of experience in the pallet industry, no one knows more about pallets than we do. Broken pallets? We can fix them. Get pallets delivered to your business. We recycle and reuse thousands of pallets. Leading the Pallet Industry Since 1969. Fairfield Pallet is a full service pallet provider based in South Jersey, manufacturing and repairing pallets for over 40 years. We are committed to giving you a quality product and courteous service. We carry a variety of sizes and grade pallets, both used and new, to cover all your pallet needs. Whether you’re shipping across New Jersey or across the globe, we have a pallet that can suit your specific needs. Looking for pallets? Look no further than Fairfield. Read our blog to learn more about pallets and stay up to date with news & information from Fairfield Pallet. 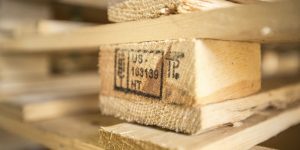 What Are Heat Treated (ISPM 15) Pallets? What Are Heat Treated (ISPM 15) Pallets? Fairfield Pallet is a trusted provider of pallets across the East Coast. Get Pallets Delivered, Repaired, or Recycled! If you're in need of pallets in New York, New Jersey, Pennsylvania, Delaware, Maryland or Virginia, send us a message to speak to a customer service representative about how we can help!